Installation of the new "CHRISTMAS IN MIDTOWN" is underway at the park. One thing that you will notice as you go through these photos is that the park has gone away from the normal "outline the building" with lights to a full "blanket the building" method. In addition, they have added faux additions to almost every structure in Midtown to make the area feel even taller and "fuller" during the evening. Every single structure is completely covered in lights - including the roofs. Carrie's Candles is a good example of the roof being completely covered. 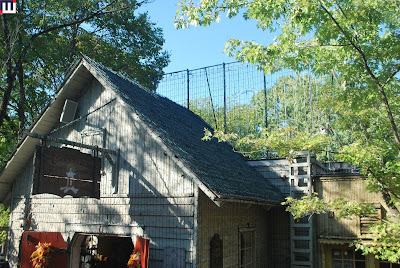 The framing for the faux additions is rather noticeable during the day, but considering what they add to the display at night - I think most guests will overlook the fact. Very large support poles have been added to the area to hold the large props such as the moving globe, angels and more. Some of the smaller buildings have rather large additions on top. This store across from Grandfather's Mansion is probably the most noticeable. While Grandfather's Mansion has the blanket lights - it also incorporates some of the outline style as well around the windows and the different door frames on this side of the building. 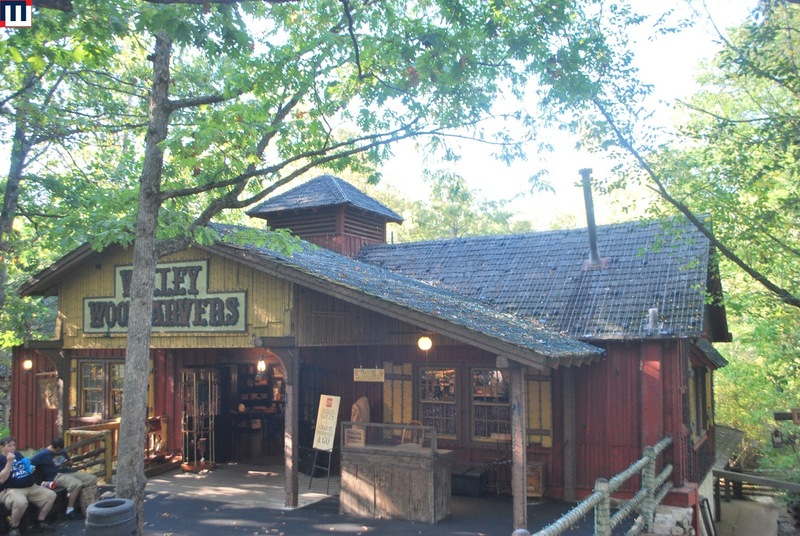 You can really see the lights on the roof of Valley Woodcarvers. They have yet to add the "bottom" of the "tree" that will be on the old Treehouse platform, but there are more faux building tops on the building next to the platform. Another pole and another building covered in lights. This tree is covered in very thick icicle lights. There are several poles in the area. The final building that is decorated, near the Corkscrew Pass. Christmas in Midtown debuts with the opening weekend of An Old Time Christmas. I personally cannot wait to check out this new lighted area. 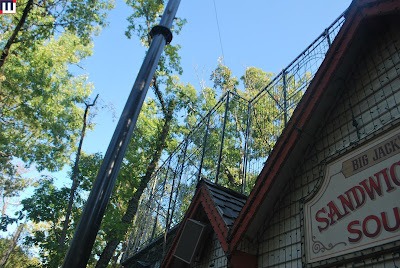 We decided to take a trip down to SDC to see the construction for ourselves. First we would like to show just how big of an area the new construction fence surrounds. You can see it is all the way out to Valley Road. The Skillet Cookery is to my left and the Christmas Shop is to the right of this photo. There is an additional fence from Poke Salad Mary's to the Skillet Cookery. Behind that fence is this new foundation. 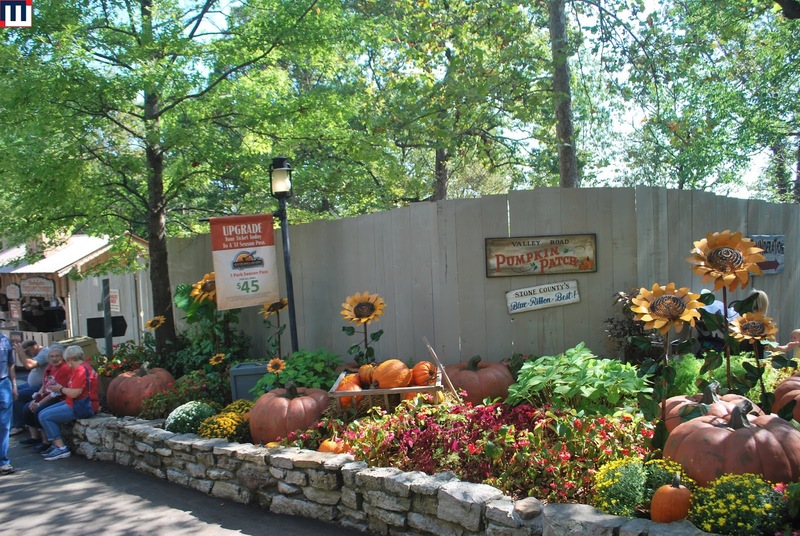 You can see the new ThuNderaTion arch there in the background on the other side of the fence. This is obviously going to be the souvenir shop for Time Traveler. I am surprised at how small it appears to be. The exit pathway from Time Traveler is pretty prominent over in the picnic table area near Poke Salad Mary's. This section is directly behind Poke Salad Mary's. A lot of work has been done of the pathway leading down to the queue area. The exit and entrance paths are pretty much side by side. Some bracing has been installed here, probably for fence railing. You'll definitely get your steps in getting to and from this new ride. They have stained the wooden handrails on the exit pathway. I got to admit, I did not originally care for the paint scheme of the station, but it actually looks pretty nice in person. 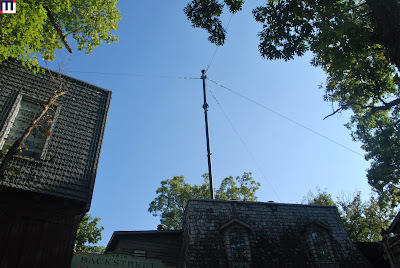 Here is that transfer track in all of its glory. I kind of wish there were a few more mature trees in between the two coasters. Looks like they have bracing installed for a cat walk next to the final curve of track back into the station. I think it will continue around to the final brake run. Doesn't look like there is track installed in the maintenance bays yet. 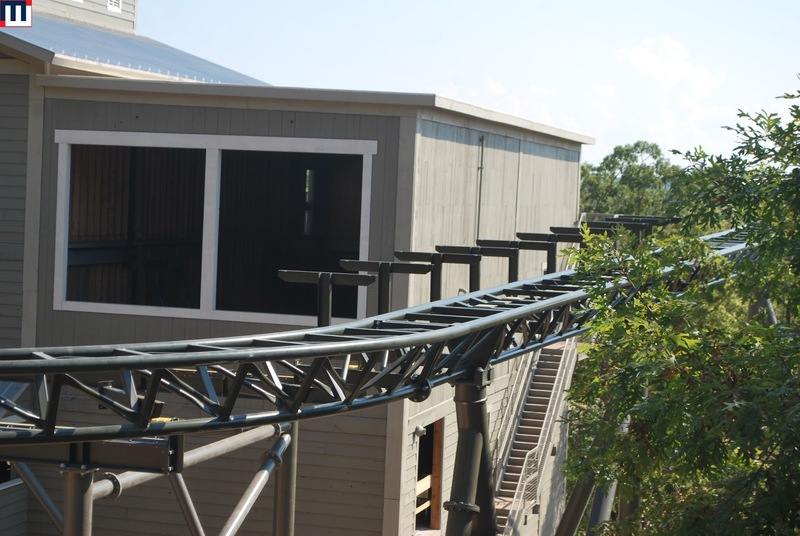 Here's that bracing on the final brake run area that I was talking about. The final brake run is higher than the initial swoop out of the station by TNT. The view from the Culinary School porch has forever been changed. I do like how they attempted to make the track and supports blend in though. Mortimer's Magic Box has moved to the bottom of Hill Street, across from Fire in the Hole. This new location was necessary as the old location had to be removed due to construction of the new entrance of Time Traveler. The new store is not much bigger than the old location, but it feels much more "open". They have a new stage just outside (which you can see in the picture above) where they still perform magic demonstrations. They now have Engine No. 6 on display by the train station. Finally, the letters on the Flooded Mine sign have been repainted and look great. Welcome back to Silver Dollar City and the newly renamed fall festival. This year they are calling it the National Crafts and Cowboy Festival. Not much has really changed from the National Harvest Festival days other than the name. 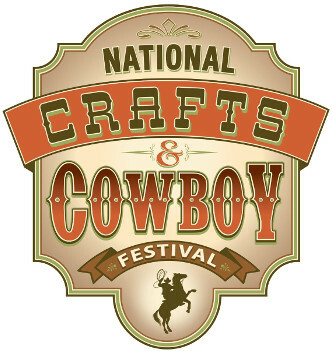 The main focus of the festival is still the crafters. The restored original stagecoach from "early SDC days" is back again this year. There are a lot of crafter stands on the square this year. Bratcher Cooperage has been coming to this festival for as long as I can remember. 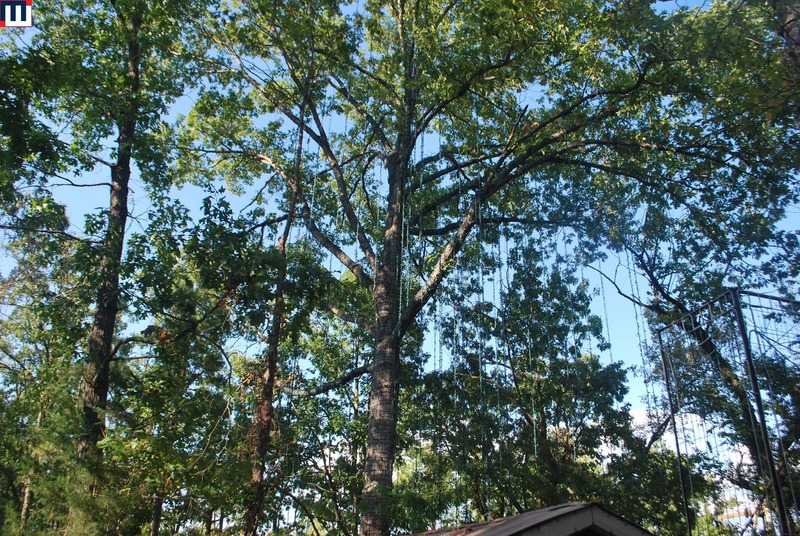 Washington Forge has become another staple for the festival. Lots of different artwork on display for sale. The horseshoe sculptures were pretty neat. Buck Taylor was back again with his famous Western artwork. Chuck wagon cooking is back again this year. Make sure you check out one of his demonstrations as he provides free samples afterwards. The Farnum Family was performing on the Cowboy Poet Stage today. I'm pretty sure this family has performed at the park during Bluegrass & BBQ before. They were quite talented. 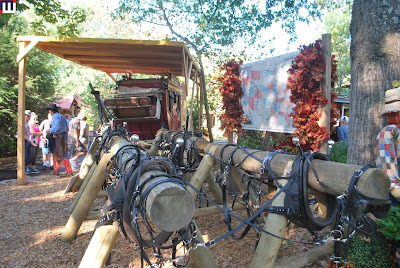 Make sure you check out all of the displays in the Red Gold Courtyard. The Wild West Show is back again for another season at the Red Gold Heritage Hall. The Hoop Dancer is very talented. The trick roper does several routines but ends with this very large loop. The dog act is hilarious. Check out the size of that dog pulling the stagecoach. The guy who performed the trick roping comes back and demonstrates the bull whip. 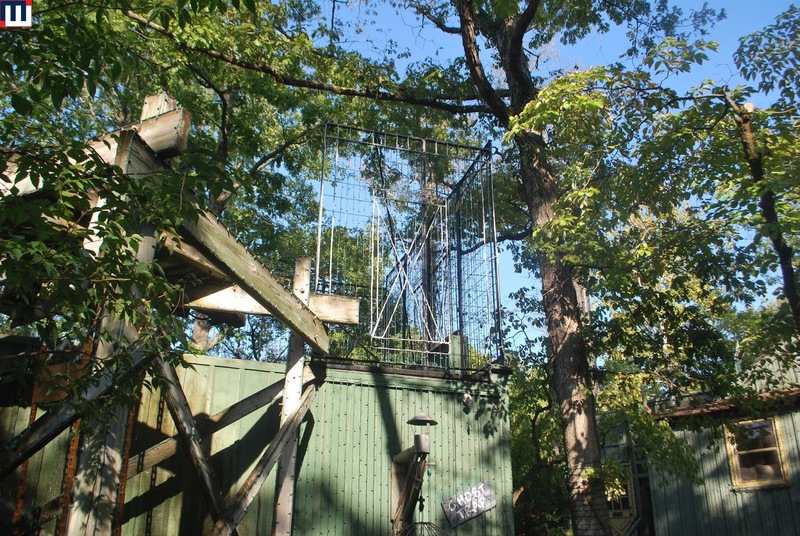 A new act for this year is marksmen shooting. She starts by firing at balloons while riding her horse around the arena. She finishes her act by doing the famous over the shoulder shot that Annie Oakley performed in Wild Bill's Wild West Show. 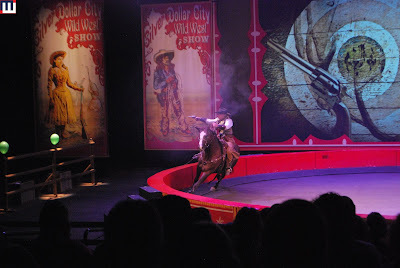 The final act featured trick riding. The three females were quite talented. The show ended with 5 horses being rode around the arena. It was a great show and an excellent festival.